The city’s activities to commemorate the Dr. Martin Luther King, Jr. holiday will culminate in a special set of events on the official holiday date – Monday, Jan. 21. Saturday features three major events: the Rev. Avery C. Alexander Social Action Forum at the Dryades YMCA on Oretha Castle Haley Boulevard; the Day of Service at the Bayou Bienvenue Wetland Triangle in the Lower 9th Ward; and the National Conference of Artists 21st MLK Exhibitions at locations across New Orleans. Monday concludes the celebration with three main events: an opening program begins at 9 a.m. at the New Orleans Jazz Market featuring speaker Marc H. Morial, the former mayor of New Orleans and current president and CEO of the National Urban League. 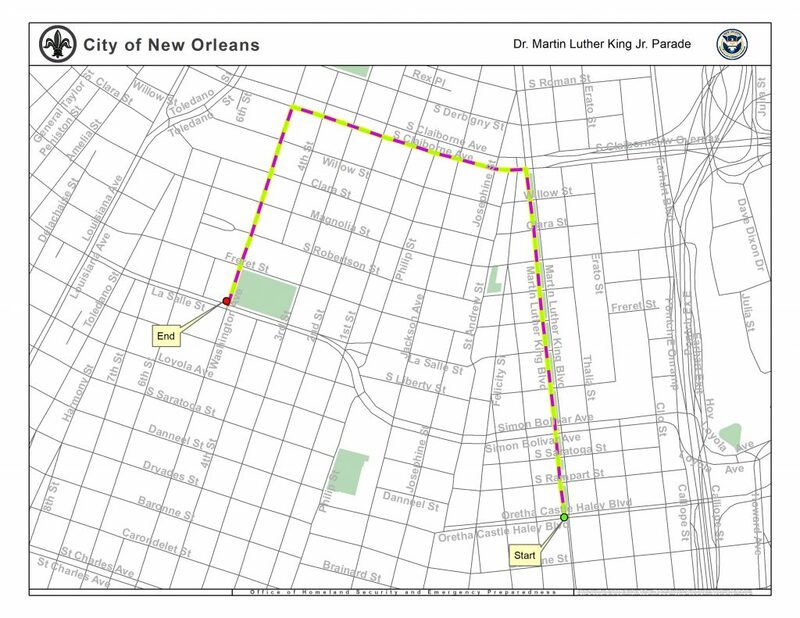 The march will begin immediately after the opening program; and the “Remember, Celebrate, Act” MLK Day of Play at A.L. Davis Park (the official end of the march route). For more information on all of these events, visit the city’s official event page here. On Monday, traffic will be restricted along the route depicted above. Expect road closures and traffic delays during the parade. Please expect delays on the following RTA routes: 15, 16, 27, and 28. All RTA service alerts, updates, and detours can also be accessed by downloading the RTA’s GoMobile app. To learn more, visit www.norta.com or call Ride Line at 504-248-3900. Sen. Cory Booker to speak at MLK event for local students Video: Marc Morial, Zulu club honor Martin Luther King, Jr.